Recorded on September 25, 2011. Ugh. For starring a member of the Fart on a Snare Drum Club this movie was a giant let down. I saw it for the first time a couple years ago, and I wonder if I would like it more if I had a sense of nostalgia about it. I did like the mythologies, the Quickening and all that jive, but man. Just awful. I’m assuming you’re talking about Clancy Brown? 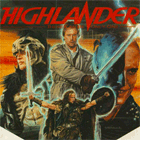 I think the idea and concept of Highlander are great, but the execution of this movie is a stunning failure. I truly do not understand the slavishly devoted following this movie has. For what it’s worth, and I think I mentioned it on the show, I truly enjoyed the tv show, and it seems that’s where this idea thrived and succeeded. I am still genuinely mad at all the folks who apparently knew how bad this movie was and said nothing. Nothing!